Comics have always had a rough relationship with science. Many comics had their roots in science fiction, so it cannot be said that science is entirely missing from comic books. It’s just that, occasionally, science gets in the way of a good character or a good story. When that happens, one of them has to go. Since comics are a medium for storytelling, it’s easy to guess which one loses out. 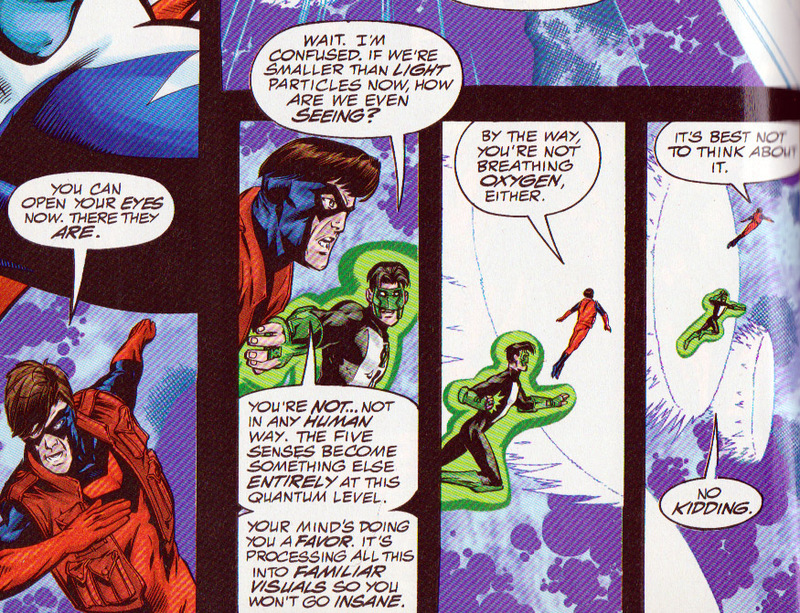 As long as you can suspend your disbelief, the egregious abuse of science in comics can be overlooked. Things that we know to be impossible are not only forgiven when reading comics (and many other forms of fiction, be they movies, TV or books) it is truly necessary. I mean, that’s the whole point of fiction – to show us a world that isn’t our own. Still, for the nitpickers, there’s plenty to object to in comics. Gross violations of the square/cube law, impossible particles, anatomical impossibilities, causality problems – you name it. It’s very easy to look at the use of science in comics and point out what they’re doing wrong. So why has James Kakalios gone to so much trouble to point out what comics get right? Two reasons, really – he loves comic books and he loves teaching physics. And he found (much to his pleasure, I’d imagine) that he could do both at the same time, using comic book examples to boost the interest of his students, making it the kind of physics class I would have loved to have taken. In this book, Kakalios gives us a basic physics course in a few brief sittings, starting with the Newtonian Classics and working his way up to quantum physics. By using the popular superheroes of the day, he gives us a way of thinking about physics that is not only interesting, but also makes sense. For example, he uses good old f=ma (with a few extra bits of math thrown in here and there) to determine exactly how fast Superman (back in his Golden Age, pre-flight incarnation) was going when he leapt over buildings in a single bound. He looks at The Flash and how he might use quantum tunneling to go through walls, as well as why running on water would not only be possible, but at the speeds the Flash reaches, absolutely necessary. And of course, the Atom gets a lot of page space when it comes time to look at the world of the incredibly small, and the quantum rules that govern it. Could Spider-Man’s webbing really allow him to swing like that, and why was Gwen Stacy’s death one of the best uses of physics in a comic? How are Iceman and Storm’s powers related, and how do Magneto’s powers really work? Did Krypton have a core of neutron star material? Does Conservation of Energy apply to the Flash, and how does the technology work to make Iron Man’s suit possible? Two things make this book much more entertaining than The Science of Superheroes. The first is that it focuses solely on science, instead of trying to split its attention between the science, the characters and the history of the comic book industry. This is a real science book, despite the presentations – there are formulas in here, and it does sag a bit in places (especially the quantum physics part, but he does warn us about that). 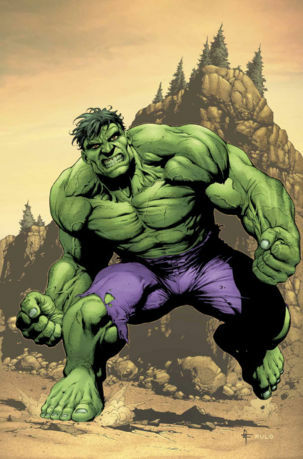 The Hulk’s pants are a HUGE miracle exception. And I want the number of his tailor. But that’s okay, because Kakalios isn’t out to debunk these heroes, and that’s the other reason why this book is good. He grants them a “miracle exception” that allows them their powers, and then asks, “Okay, assuming Ant-Man can shrink down to six inches, would he still be able to do what he does?” And then he goes on to show how the hero can (or can’t) do what he’s supposed to be able to do. One of the biggest problems in science education is keeping students interested. Your average high school (and college) physics class will go on about weights and levers and inclined planes, presenting the laws of the universe in a fairly abstract (and dull) fashion. Like many students, I found myself thinking, “When will I ever actually use any of this?” For most students, the answer is Never. Same goes for a lot of what’s taught in high school – it may broaden your mind, but it’s likely to be impractical knowledge. But knowledge doesn’t have to be practical to be worthwhile. Knowing how the universe works, what its laws and restrictions are, may not help you in your day-to-day life, but it makes you into a better citizen of the universe. It imbues the physical world with some semblance of rationality, an assurance that while we may not always like what the world throws at us, there is at least a reason for why things happen the way they do. There is consistency, there is order, and in a mixed up, topsy-turvy world like ours, that’s nice to know. What’s more, this book helps do what I always try to do – bring legitimacy to superhero comics. Even in this day and age, it’s very easy to look at Superman and Spider-Man and the Fantastic Four and say, “That’s just kids’ stuff.” It’s not. Okay, yes, the stories tend towards the simple; they’re flashy and bright and often espouse rather basic moral schemes. But they can be examined in many lights beyond that of simple entertainment, and reveal a wealth of information and understanding about the world in which we live.